The bill was full with European metallers Carach Angren (Netherlands), Mors Principium Est (Finland), Wolfheart (Finland), and Empyrean Throne (California). I’m a huge Wolfheart fan. 2017’s “Thyjyys” is one of the best albums I’ve ever heard. So, when I found out I had the interview with Tuomas Saukkonen I have to admit I was both excited and nervous. I’ve done over 100 interviews, and it’s the rare occasion where I’m nervous, but on this night I have to admit I really was. The newly revived Paris Theater is an intimate little theater with private landings equipped with couches and pretty chandeliers. With a capacity of just over 200, the setting is private and personal even if it’s not meant to be. I arrived at the venue early with the instructions from Wolfheart’s PR to find Tuomas either before or after soundcheck. I walked delicately through the venue, careful to not be in the way of the 40+ musicians and gear being shuffled into the small space. As I headed down the corridor to find the tour manager or Tuomas, I looked to my right just as I stepped into the threshold and there was Tuomas…sitting casually on the couch. I introduced myself and we made arrangements to do the interview after soundcheck. When he was done, he collected me and we walked up the tiny steep staircase to the smallest green room that I’ve ever seen. We started the interview as Carach Angren and Mors Principium Est started their soundcheck and soon realized we’d need to move due to the massive sound. 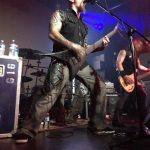 The interview revealed some great discussion on what it takes to make the unique style of Wolfheart’s music. I asked questions as a responsible music journalist and asked questions as a super fan. I asked him how to properly pronounce “Tyhjyys” and revealed that we just say the letters. He talked in detail about the songwriting process and how intimate music can be. I told Tuomas how much “Tyhjyys” touched me, and he had some funny and witty responses to my self-revealed love of his music. We concluded the interview after about 25 minutes, and I found my friends and prepared for the show. Local opener At the Seams had to cancel due to a personal issue, but the show started on time with California’s Empyrean Throne. Very Dimmu Borgir both in their look and sound, they successfully revved up the small, but growing crowd. After combating some technical issues, Wolfheart took the stage. Their sound is massive and translates just as well live as recorded. The powerful stance of Tuomas mixed with the swirling headspins of guitarist Mika Lammassaari and bassist Lauri Silvonen made it visually exciting; Joonas Kauppinen’s drumming was perfect as he sat tucked away in the corner. I stood up front, but held back a little so not to be an obvious super fan. I found myself directly in front of Mika, who dumps water on his head between songs, and swirls frantically causing the water to spatter on the crowd; I was wet. He was fun to watch, but the best part was simply shutting my eyes and feeling what Tuomas had to say through music. There is something about Tuomas’ writing and vision that makes Wolfheart very special. 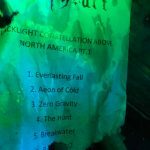 I picked up another copy of “Tyhjyys” and purchased the new “Constellation of the Black Light,” along with a girl tour shirt (I wish more bands made these). I had the nice fortune to find Tuomas and Joonas outside, and happened to stumble upon a silver sharpie (thank you William). 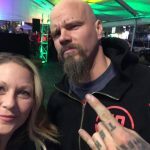 Rumor has it that we’ll see Wolfheart back in the states in 2019. I’ll be back in the front row. You can hear my interview with Tuomas here.